Dimensions 0.50 by 5 by 8 in. Amazon.com description: Product Description: The author of the breakout hit Here Comes Everybody reveals how new technology is changing us for the better. In his bestselling Here Comes Everybody, Internet guru Clay Shirky provided readers with a much-needed primer for the digital age. 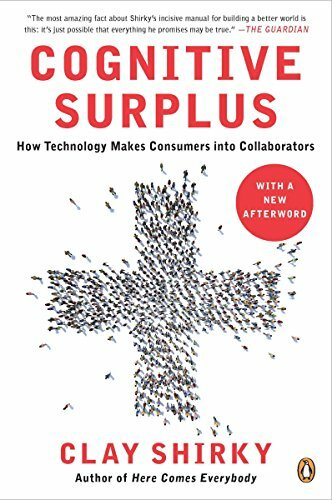 Now, with Cognitive Surplus, he reveals how new digital technology is unleashing a torrent of creative production that will transform our world. For the first time, people are embracing new media that allow them to pool their efforts at vanishingly low cost. The results of this aggregated effort range from mind-expanding reference tools like Wikipedia to life-saving Web sites like Ushahidi.com, which allows Kenyans to report acts of violence in real time. Cognitive Surplus explores what's possible when people unite to use their intellect, energy, and time for the greater good. About: The author of the breakout hit Here Comes Everybody reveals how new technology is changing us for the better.